Despite the fact that I have been gone the past week and had less than a week home between trips, I am in the midst of a new art quilt. 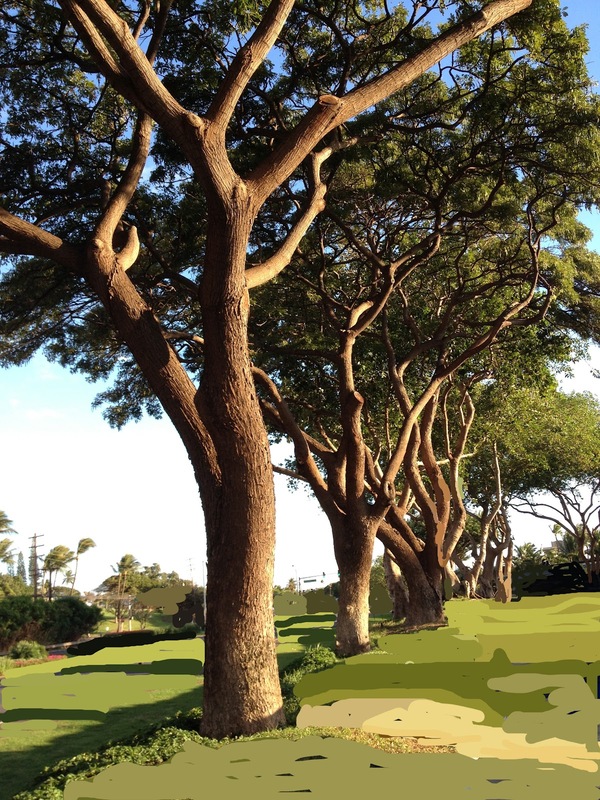 A photo taken in Maui inspired me and I had drafted a sketch based on the photo before I left. 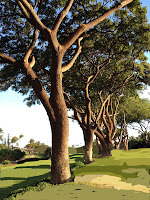 Here is the edited photo I used for my sketching. Before my last trip, I created a tracing paper version that began to identify the various pieces. You can see the part of the art quilt that I had cut out before I left on my trip. I returned full of enthusiasm and though I anticipated a busy weekend, I still managed to get to my art and the main tree is 90% cut. I am basically using Transdoodle to transfer the design to fabric backed with MistyFuse. At the moment the pieces are pinned to a piece of muslin backing. Since I still want to add some sky into the leaves of the tree and want to be sure I have allowed properly for the placement of the trees, I won't fuse to the muslin until most of the piece is complete. There is a tremendous amount of detail that still needs to go into the remaining portion so I expect I may be cutting and fusing all week. But, I am really pleased with the feel of what is emerging. And, I can't wait to get to the quilting!